While driving my son to soccer practice we found ourselves scanning the satellite radio for a perfect “sing along.” Granted, we listen to Christian music 99% of the time, I found myself tuning into the “Today’s Hits” station to catch a cool song because-yes-every dad wants to be cool deep down inside. However I found the devil in the remaining 1%. Yes he was there and his words were HAUNTING! Let’s just say, I couldn’t turn the station back to praise and worship fast enough! You see, I stepped out from underneath the protection of my Savior’s wing into what appeared to be a harmless act-it’s just music, right? WRONG! Dear brothers and sisters, this was more than music, this was a gateway that I was in the process of opening all in the name of rhythm and beat. If you’re not careful, you too are singing right along to the catchy song not fully understanding what you are opening! You are opening yourself up to temptation! Instead, the Word instructs us to RUN! Don’t sing along to songs that reinforce gratifying the flesh-NO! RUN! In full transparency, my flesh wants to rebel back and say, “But the songs are just so catchy and my son and I love to crazy dance to the beats. It’s good bonding time right?” Sadly, this is the best manipulation of the devil that one can identify. You are not bonding with your child, you are not having fun, you are not enjoying the catchy rhythm…you are systematically exposing yourself and your children to the temptations of this world. Even worse, you are singing words that say, “It’s ok that you fall for these things; it’s fun; it feels good; you’ll love it!” When the whole point is to trap you and destroy you! I pray that while we live life together, we continue to encourage each other to remain faithful, pure, and protected. Don’t venture out from your Father’s wing. What appears as harmless is only satan’s master manipulation to get you to step out! Instead, RUN from his temptations and be ever so cautious! Stay Alert dear friends! Question: Have you really LISTENED to your music lately? 21 The teachers of the Law and the proud religious law-keepers thought to themselves, “Who is this Man Who speaks as if He is God? Who can forgive sins but God only?” 22 Jesus knew what they were thinking. He said to them, “Why do you think this way in your hearts? 23 Which is easier to say, ‘Your sins are forgiven,’ or, ‘Get up and walk’? God has spoken loud and clear today! He speaks everyday; yet, I’m thankful for the affirmations of His voice through various entities. Today, He has spoken deeply through three dear friends. Even more, these messages are in agreement with each other, which makes this even more special. The lesson: personal inadequacy, God’s love, and following God’s will. In our struggle to remain in control, we find that we sit at the table with anxiety, stress, worry, fear, and doubt. We push back the chair and shout, “Enough!” I refuse to invite these demons as intimate company to my table. I no longer choose to sit in the presence of anything that goes against God’s promises and His commands. You turn around and something changes; you now see the filthy and ugly spirits that inhabit your personal space. How did this happen? I don’t want them here! Your eyes have been unveiled and the lies are uncovered. You are weak, bruised, and unable to carry your burdens alone! In what feels like the last ounce of strength, you call out for prayer! Your spirit begins to rebound and you find just enough strength to crawl into the inner sanctuary where Father God gently picks you up and places you softly under His wing – you rest! Yes – VICTORY! There is no defeat in surrendering to God! His strength is made perfect in our weakness. In humble spirit, God places before you a vision while you rest. You see flashes of light breaking through the darkness and eliminating the doubts. You see warriors rushing into spiritual battle waging war through prayer and petition on your behalf – warrior angels all around! Legions upon legions of His mighty army are called to your right hand as your enemies fall. A path is created by the mighty arm of God’s protection where you see your prayer warriors reaching in to lift you up. Each one bearing a special gift. You are lifted effortlessly and carried into the inner sanctuary and placed at the throne! You awaken in God’s arms feeling refreshed and full of light. You feel your questions leaping off your mind into God’s ears without uttering a single word. Your mouth remains closed as in full reverence – as it appears as though the tongue would taint the atmosphere. Yet, He hears you! He answers without hesitation and without prompting for He knows all things, “My child your sins are forgiven. You were brought here on the prayers of your friends. You were carried by those you entrusted, and they await your return.” In full abandonment, you can only utter, “I’m inadequate, my Lord! I cannot do these things you are asking.” With the tilt of His head and a piercing eye, He breathes His Word upon your spirit, “20 Now may the God of peace, who brought up from the dead our Lord Jesus—the great Shepherd of the sheep—with the blood of the everlasting covenant,21 equip you with all that is good to do His will, working in us what is pleasing in His sight, through Jesus Christ. Glory belongs to Him forever and ever. Amen. You begin to feel His love pour over your soul, pressed down, shaken, and running over. You are renewed, delivered, and sanctified. Through continued prayer and fasting, you gain an even deeper understanding of His calling on your life, your purpose, and your mission to do His will! You fully understand that in your own strength you will fail; however, with the strength of the Lord, all things are possible for you can do anything through Christ who gives you strength. Therefore, go and do as the good Lord has called you. Moreover, seek to remain under His wing and watch Him do far more than you could ever imagine! The seasons will change, your children will get older, and you’ll turn around one morning and remember the day you surrendered to His will – all for His glory! Thankful for Christian friends and prayer warriors. Thank you Sarah F., Jeremy F., Aimee A., Leslie M., Katie T., Tanya J., Rita H. for all your spoken words today. You will never fully understand how your separate messages throughout the entire day were used collectively to speak God’s message today! Yes, there in the middle of an elementary Sunday School class sat a curly, redheaded boy soaking up every Bible lesson like a sponge. When my Sunday School teacher announced that she was going to share God’s phone number with us, I couldn’t find a pencil fast enough! She said, “Anytime you want to talk to God, call 33:3, and that’s how you can reach Him.” If I had had a phone nearby, trust me, I would have dialed these short but what I thought were the most important numbers in the world! After some clarification [did I mention that I’m very literal! ], I realized the teacher was making an association to help us remember our memory verse…well it worked! Let us bask in the thought that the Almighty not only hears us when we call but answers us! He tells us unsearchable things! Let that wash over you for just a moment. Truly my brothers and sisters, in our finite world, we cannot comprehend this fully; yet, I want to try! The God of the infinite universe; the One who set all things into motion not only wants to hear from you but He loves to communicate with you! This is the beginning of a true and intimate relationship – communication, trust, belief! So I say to you today, I know God’s personal phone number…would you like to have it too? It’s 33:3, “Call to me and I will answer you…” Even when you feel as though God is quiet, He is still communicating in different ways – don’t miss it! Always be looking for His whispers. In the storms, in the valleys, on the mountain tops, He is speaking, teaching, delivering, and saving! I am often reminded of my previous therapy team that I had the distinct privilege of managing in Plano, Texas. We were just so different; however, we all recognized our common bond as human beings and citizens of this earth. I speak globally because this team represented just that – citizens from various countries across the world. We had staff members from China, India, Iran, Mexico, Philippines, and South Africa to name a few. What made us different? Harmony! Our physical features were definitely different from each other. We each had an accent of origin, varying worldviews, and degrees of beliefs. Are you surprised to hear that we enjoyed each other’s company? Even more, we enjoyed working as partners and co-workers for many years before several of us moved on to other locations. I will say that it is through the encouragement of our Savior Jesus Christ that we are to live in harmony with one another. Sadly, we live in a world where the color of your skin is enough variance to pass judgement yet we bleed the same and Jesus died for all mankind. Even more, we live in a world where the origin of your birth is enough to persecute your neighbor. Furthermore, we congregate within our own cities and towns with those who only think like we do and most certainly believe exactly like we do because pride is soul-deafening. My eyes span the masses and it’s always the same. We speak of unity and harmony yet our cognition succumbs to the traditionalism and habitual patterns of our existence resulting in stagnate character. This does not exemplify Jesus Christ! He was a master at seeking the different, the strange, the…shall we say, “Sinner!” This can only represent ever single human being – even the one staring right back at you in the mirror. His very existence emulated unity and love! In fact, I had a wonderful conversation with a very dear friend of mine just yesterday who shared this same sentiment. We truly cannot comprehend the depth and breadth of God’s love for us in that while we were still sinners He sent His Son to die for us! I fall on my face at the mere thought! I pray that we spend each day seeking unity and love for our fellow man…in essence, living like Jesus! This passage delivers such conviction! I strongly believe that each encounter, every single one, is inspired to teach. What are you learning from those you encounter each and every day? You are not simply on a hamster wheel without purpose and most importantly without destination. Your life is God-inspired and perfectly designed by your Creator. I almost could not see through the endless piles of documents, patient charts, and mail as I opened by office door this Wednesday morning. You see, being away from work for over a week can be relaxing from some, but for others, let’s just say – stress awaits! In my organizational attempt to outline and complete my “to-do” list, I almost missed the most important part of my day – interacting with people – learning from others. The “old me” would have basically locked my door and knocked out all my tasks until fully completed – to essentially achieve peace in accomplishment. However, let me emphasize, the “old me.” I’m not perfect, but I placed my worries and stress into the hands of Father God and kept my door open. Don’t get me wrong…you’re thinking, “What’s the big deal?” Leaving my office door open signifies, “I’m available to you!” Meaning, I will drop whatever I’m doing to listen and engage in your request, your problem, your story no matter what is in front of me or what deadline I must meet. For someone with a task-oriented personality, this can be rather difficulty – but I did it! During one late afternoon open door encounter, I was brought to such conviction and quietness as one individual began to ask for prayer for a new onset of significant medical complications. My soul rested and peace filled the atmosphere as God appeared to say, “This is what life is about my child” – listening, engaging, sympathizing, ministering, and praying. This individual shared a profound prospective that is worth spreading to the world. Through her eyes, she sees and has experienced judgement herself. People can truly be cruel, hateful, jealous, and down right mean. In her words, “After dealing with the loss of a child and a near death encounter myself, I choose to love others and show compassion. There is no time for hypocrisy, backstabbing, jealously, and rudeness.” These words were sharp yet needed to be spoken. It was almost like a cleansing. Truth and light are power. Darkness will be exposed and lies will be crushed! The devil has convinced many that it is our right to judge others. I mean, I have “better taste” than she does so that gives me the right to judge how she chooses to live; I have advanced educational degrees so that gives me the right to judge him for his lack of knowledge. I have lived in large metropolitan areas so that gives me a right to judge those who never left “small-town” living; I have worked in this job for a lot longer than she has so that gives me the right to judge her for her errors…o.k. you see how silly this sounds! We would never stand for this if someone outright verbalized this type of thinking. However, we ALL believe some form of this as it relates to our own lives. Let’s stop the cycle now! We are not qualified, justified, or deemed righteousness enough to judge anyone; this can only be fulfilled by the hands of the Lord. Let us seek peace and understanding as we draw others closer to God the Father, not farther away! Imperfection! Nothing destroys a person’s feeling of self-worth more than seeking physical and all-around total perfection! In a society of comparison and competition, we are constantly being judged. I could not help but be reminded of this when hunting for shells. What was I seeking? “The perfect shell!” Of course I was! In a sea of variety and versatility, my eyes were peeled for what the world would define as “the best,” most unique,” or “perfect!” What I found instead resulted in a deeper meaning-God’s creation is good – what we call imperfections are His attention to detail! This passage in Philippians speaks volumes. We will not obtain complete and utter perfection until we are face-to-face with our Savior. However, we strive daily to follow His ways and be salt and light! As a believer, the Holy Spirit lives in you. Remember, the same God who raised Jesus from the grave lives in YOU! We may not be perfect, but we are special!! 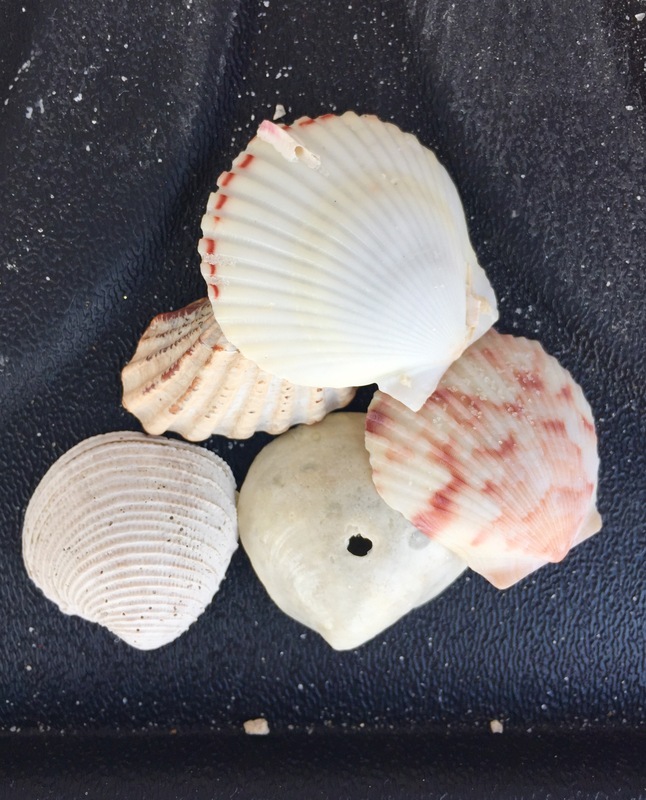 We may even be “imperfect” from a world’s-view, but you are fearfully and wonderfully made so I would venture to say – (just as the shell) you ARE unique and you ARE the best because the is no other you! That makes you a perfect creation! And there you stand – at the crossroads of life! There are only two directions one must choose – God’s path or your own. Often, you stand silently, quietly, looking in both directions asking yourself, “Which path is best for me?” – all while God is pointing you clearly into His direction. Yet, the anguish is real! You begin to feel the weight of destiny falling heavily upon your shoulders. What if I make the wrong decision? I just can’t see far enough down either path to wisely make the call! You step into the center and turn both right and left; you find yourself rising up upon your toes if only to get a better look – a longer look down the roads. In your limits, you find that shading the sun with a shaking hand in hopes of seeing just a bit further was just as futile. Your legs cramp, your eyes glaze, and you collapse. Yes, there in the middle of your crossroad, you finally reached the point of surrender. After wiping the sweat from your temples, you attempt to gather yourself, and you see an outstretched hand. You look up but the radiance is blinding. You therefore reach – you reach for the hand in faith not knowing exactly how you will get up or move down your new path, but all you know is you have to reach! This “stranger” begins to dust you off, but you politely refuse, “Oh I’ve got it; thank you anyway.” Yet, the draw is inviting. In your confusion and embarrassment, you’ve yet to comprehend who is assisting you. You feel your strength return and after looking within yourself for answers to questions you’ll never understand, you finally see beyond yourself and you —look! There He is! Your Savior God pointing the way. He was there all along – it’s often hard to see what is right in front of you when you are self-seeking! Do not rely on your own understanding or judgement – it’s faulty at best! The topic of crossroads has come up several times over the past two weeks. I have been in a recent conversation with friends over how God called them to a new location out of faith in ministry. This sounded all too familiar – actually emotionally overwhelming. My wife and I have a similar story of God calling us away from Dallas, Texas, a place where we truly loved and where our son was born, to grow roots back in south Louisiana. Wait, we said we would “never move back home!” It’s the classic “never say never.” The providential movement occurred as God continued to open door after door proving His way was the best way. We could not see far down the road nor even anticipate the bumps we would encounter along the way. However, His ways have proven true and right! During our last few days on vacation, our family attended a lovely beachside chapel service on Sunday morning – the topic: crossroads and this very passage in Jeremiah. This was such a wonderful reminder of how God is truly always in control, BUT when we come to those places in our lives where we truly have to turn right or left, it is always best to seek His will above all things. Attempting to see with your humans eyes will forever be futile. The amazing part is God is not just as that crossroad directing your current path. He is also standing at your next one waiting for you to arrive all while He walks with you to speak life and love. Question: What is your crossroad story? Did you see God in it? Do you now? After a long run on a rather humid Saturday morning, there is nothing more refreshing than walking into a cool room and grabbing a cold bottle of water. The liquid appears to cascade through valleys deep within the throat with a purpose to plunge into your core for complete and utter satisfaction; you initially almost cannot get enough. You pause only moments to catch your breath and then continue aggressively swallowing an overflowing amount of liquid until you are completely satisfied. However, the sad truth about our earthly bodies is that this is only temporary satisfaction. While we experience immediate satiety, we realize this cycle must continue for complete wellness and hydration. This reminds me so much of everything this world “tries” to offer in place of God’s promise. There is absolutely nothing this world can offer that will fully satisfy you. Even more, there is nothing this world can offer that will save you! Earthly promises guarantee addiction. What do I mean by that? The initial promise is to satisfy a graving or an urge. Yet, you soon realize this promise never materializes. If anything, it punishes, takes away, and requires you to seek more. My God offers a living water, a promise, that will not only fully satisfy your soul but will save you from eternal separation from your Maker. The only requirement -“Jesus stood and shouted to the crowds, “Anyone who is thirsty may come to me! '” I am pained by all the religious rules and regulations we humanistically impose upon mankind. When Jesus bore the sins of every human, the veil was torn! There is no separation for those who simply…come! So, today, I ask you this very important question – are you thirsty? Are you tired of not being satisfied? Jesus is offering living water for ALL who come! Don’t delay! Oh the lights! It’s just so memorizing – the wave nature of the lights appear to draw you in just like a magnet. Atop the inviting staircase, a peak of majestic brightness calling you one step at a time in curiosity. A wondering soul hears optimism as if all things in this world are good and safe. This calling makes each step easier, lighter, faster as anticipation overtakes reasoning. You break from the safety of the Father’s wing and just like the force of a mighty wind you race to the attraction. Wait! This can’t be! I’m here but the light isn’t as pretty in person. Your eyes span across and you see the unveiled truth of what you were chasing – broken glass, burned out lights, pests, trash, danger! What went wrong? From a distance, it was all so beautiful; I just wanted a closer look! How could this have happened? I’m afraid, it’s cold up here. Where did my protection go? – and then as quickly as you raced to the unknown, you hear the cold whisper pass just across your senses alerting you of the very thing you failed to consider – you fell into the trap of the evil one’s illusion. Dear friends, I hope we never forget that the devil does not masquerade around with a pitchfork attempting to scare – quite the opposite. He was initially described by the Creator as perfect in beauty. Therefore, it would make complete sense that his easiest tool for drawing people into complete destruction is through enticement, illusion, allure. Yet, we stand again on another promise from our Father. We are to submit to God and resist the devil and He will flee. Yes and amen! This does not say that the devil may consider fleeing or that he is even strong enough to withstand the rebuke. Despite the tricks, he holds zero authority and power in the presence of God almighty. Remaining under the protection of God’s wing assures a successful resistance – so do NOT leave your safe space! Whether you are a believer or a seeker, trust and seek God! The devil has lied to you far too long. Take back what is rightfully yours – kingdom authority given by Jesus Christ alone! As you develop a deeper relationship with God the Father, you will begin to see these traps and illusions a whole lot easier. Yet, do not be prideful. Satan is a master craftsman, and his skill is destruction. Yet, my God’s skill is perfection in salvation and NO ONE on earth, above or below earth is more powerful than that. Let us strive to be blameless in His sight. Question: What are examples of your life’s illusions and traps? How have you learned?